While many travelers prefer to rely on public transportation to get around, renting a car offers many benefits that simply aren’t available with other modes of transport. Depending on what you want to get out of your next trip abroad, there are many reasons why choosing to rent a car on vacation might be the best decision for you. When vacationing abroad, whether solo or with the family, we have a limited amount of time to experience a near-limitless number of sights and activities and often end up cutting things we really want to do out of our itineraries. If you rent a car when traveling, however, you will have the time and convenience needed to get the most out of your adventures. With public transportation, you lose a great deal of time planning, organizing, waiting in line and making stops along the way to your different destinations. Not to mention that public transport can often be unpredictable. Renting a vehicle lets you travel at your own leisure and get to the spots you want to visit quickly and hassle-free. The freedom this brings will allow you to make the most of your travels without all the added stress of having to find your way around. When exploring a new country, it can sometimes be fun to explore outside of the common tourist-trap areas. 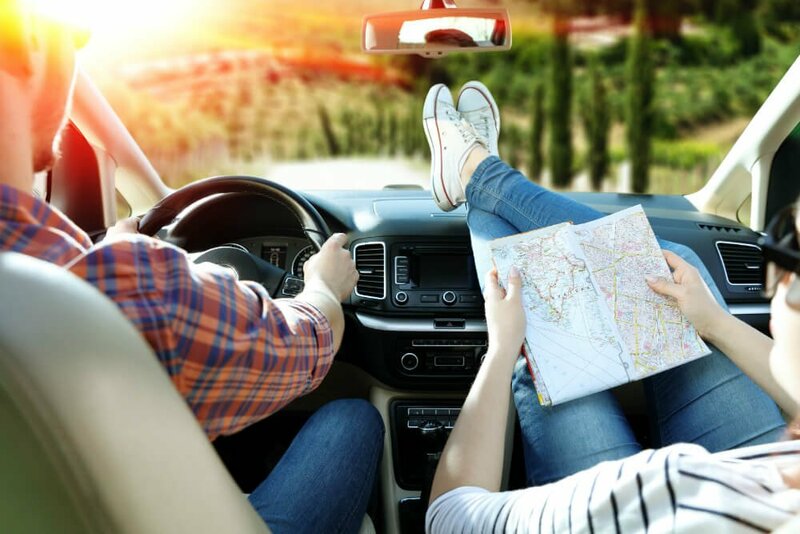 Car rental services often include a GPS system, providing you with the perfect opportunity for exploration off the beaten track without getting lost. Exploring smaller villages can give you a unique perspective of the country you’re visiting that you might not find if you stay in the most popular areas. Don’t hesitate to rent a car on your next vacation and spend a day discovering the little treasures that surround the typical tourist spots. Solo travelers understandably have less financial apprehension with using public transportation on vacation. Families and groups, on the other hand, can quickly rack up a hefty bill using taxis and buses. Renting a car is usually the more economical choice when traveling in a group. And yes, it’s generally cost-efficient, even with car rental insurance and gas factored into the equation. Moreover, traveling with small children on public transit can sometimes be a headache and make your vacation more stressful. Last but not least, having your own car gives you a certain level of comfort that just simply isn’t there with public transport, especially if you’re with the family. Plus, you get to control the radio! If you want to get more specific and find out why to rent a car in Costa Rica or learn more about our services, don’t hesitate to contact us today. I agree that traveling as a family is more expensive that traveling alone. I also feel like renting a car could be great for traveling as a group, as everyone could pitch in with money and more easily switch drivers without worrying about insurance. My friend wants to go on a road trip this summer, so I’ll be sure to share the benefits of car rental with her. Thank you for passing on the information. When traveling as a group renting a car can certainly be cheaper than having to buy tickets for each individual. Also it is worth considering that you will have a much more freedom on your trip to visit places of interest, and you will likely be much more comfortable in a rental than with public or shared transportation. I like that you talked about renting a car when traveling because you can go wherever you want and explore the common tourist spots. My family likes to travel to different places. We are 8 in the family so renting a van would be beneficial for us. We’ll definitely consider this on our next trip. Thanks! It may be difficult to find one large enough, but you could also consider renting a large SUV. Depending on your family something like a Toyota Prado may fit everyone comfortably. As long as you do not have too much luggage! I totally agree with you when you say that renting a car is more practical while travelling because not only, you can enjoy your travel without worrying about the problems you may encounter while driving your own car but also, it will reduce the expense you are going to make during your vacation as there are some cheap taxis with private driver that can fulfill your need. Thanks Jocael, yes sometimes for short distances a private driver can be more practical. However here in Costa Rica most locations are very spread out and longer trips will become very expensive. To make sure your trip is totally worry free, I would encourage considering a full coverage insurance package for completely peace of mind. I love your suggestion that with a rental car, you can explore sites outside of the tourist-traps! My husband and I really want to travel, but I’d love to be able to really get a feel for wherever we go instead of just sticking to the tourist attractions. I’ll have to let my husband know that we should look into renting a car in order to get around! Thank you! We absolutely agree and think that this is one of the strongest advantages to renting a vehicle on vacation. It provides you with a freedom of movement during the holidays as you do not have to worry about taxi prices, schedules or bus stops. It offers you with a quality of life, as when you arrive on airport after a long flight it is very easy to find the car rental offices at the terminal. It offers you comfort when it comes to visiting remote places, hidden trails or restaurants with a view in Miami. It is more affordable as rental car companies like Orange rent a car offers rate as low as $499 for a whole week. These are great points! You can not compare the comfort and freedom of driving your own vehicle versus public transportation on vacations. Also yes, many rental companies are very affordable. During the low season we offer promotional rates as low as $280 a week on our smaller SUVs. That is interesting how in a group, using taxis or buses can rack up money more compared to renting a car on vacation. Next time I go on vacation, I would love to rent a car to use for the vacation with my family. It would be much better than spending money on each child for the bus. Absolutely! Some bus rides to the farther touristic destinations can be $10-20 Dollars per person. If you have a family of four renting a car for the day can be cheaper. Compared to taxis if you are paying $5-10 per ride and you have more than 4 desintations a day again the rental can be cheaper. You will also have uncomparable freedom and comfort when driving your own car. There are number of benefits that you can avail through renting a car on vacation first and foremost it is a more affordable option as compared to both buying or leasing a car, secondly car rental companies like Orange Miami offers luxury cars like Mercedes and Ford Mustang which makes your journey comfortable and luxurious. Lastly, it offers you a quality of life, as while traveling you can find car rental offices at the airport terminals, thus allowing you to rent a car right from the terminal and traveling with comfort to their destination. The benefits definitely out weigh any costs you might save by using public transportation. If you are able to save any money using public transportation here in Costa Rica it usually isn’t much, especially considering the benefits you would be sacrificing. Target also offers some luxury model 4×4 SUVs such as the Toyota Prado and gives free transport to and from the airport making your renting experience as easy as possible.